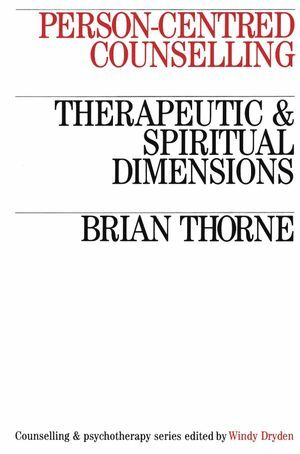 This book draws together chapters, articles and lectures from some twelve years of Brian Thorne?s professional life as a person-centred therapist. Brian Thorne is Co-founder and Professional Fellow at The Norwich Centre for Personal, Professional and Spiritual Development, Emeritus Professor of Counselling at the University of East Anglia, and a Lay Canon of Norwich Cathedral. Thorne is an internationally recognised figure in the field of person-centred therapy, and was a close colleague of Carl Rogers. Chapter 1 The blessing and the curse of empathy. Chapter 2 The God who comes: Good Friday 1946. Part II Theory and Practice. Chapter 4 The person-centre approach to large groups. Chapter 5 The quality of tenderness. Part III Values and Meaning. Chapter 6 In search of value and meaning. Chapter 7 Ethical confrontation in counselling. Chapter 8 Carl Rogers and the doctrine of Orginal Sin. Chapter 9 Counselling and the grocer's shop on campus. Part IV Papers for Special Occasions. Chapter 11 Counselling and community development. Chapter 12 Conventional and unconventional relationships. Chapter 13 Who hates the counsellor? Chapter 14 Carl Rogers: The legacy and the challenge.